operating a laser tag business. In brief, these documents have been compiled after years of extensive laser tag, and entertainment industry research. Beginning with our full length, updated laser tag product brochure. Moreover, we leave nothing out and go into great detail about all the different state of the art products and options Delta Strike has to offer your laser tag business. Overall, everything from arena targets, Delta Strike Phaser breakdowns, and examples from the laser tag industry can be found in this downloadable PDF. To help you make the most of the Laser Tag business model, we’ve put together an outline of the factors that Delta Strike has learned to be crucial in building a thriving laser tag business. This has been built on the personal experience of Delta Strike’s founder and CEO Doug Willems’ own success with operating a center and many years supporting laser tag businesses around the world. In this White Paper Delta Strike covers what could be the most important factor when operating a successful laser tag business, location. After reading this white paper you will know exactly what you need to consider when analyzing a location for a laser tag business. Laser Tag is becoming more and more popular in Theme Parks across the world. This white paper goes into the strategy and tactics around makings sure Laser Tag is a successful attraction in your theme park that will keep guests coming back for more. 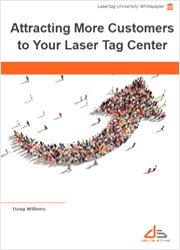 In this white paper Delta Strike dives into the strategy on how to attract the maximum number of customers to your laser tag center. Fill out your information and get your exclusive download. In this white paper Delta Strike discusses some of the best strategies to package your laser tag games. We cover different approaches to maximize income in relation to the length of time that a customer spends at your place of business.